Suffering form hip pain after running (or while hitting the pavement)? This article is ideal for you. In fact, you are about to learn how to deal with painful or sore hips from running as well as how to prevent any further damage. Sure, hip injuries, unlike knee ailments, are not a huge problem in the running world, but a lot could go wrong. 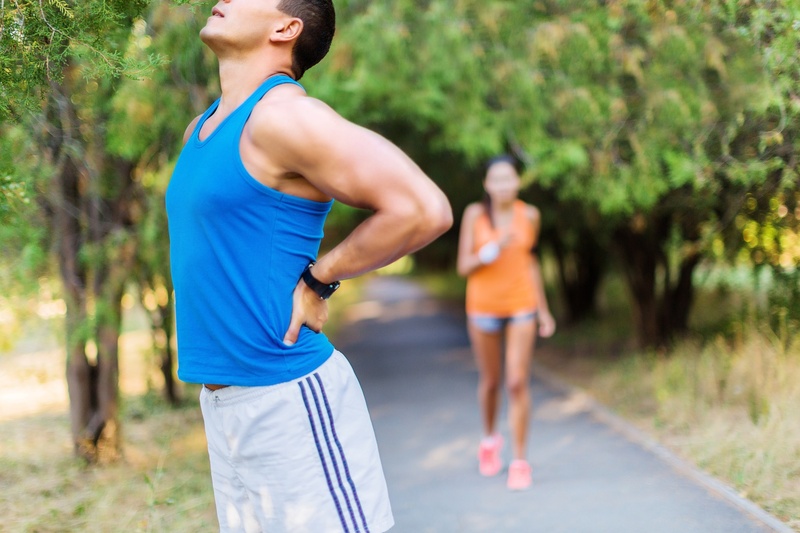 Left unchecked, what started as a mild hip soreness may turn into a debilitating injury, which may bring your running routine to a screeching halt. In today’s article, I’ll discuss the primary conditions causing hip pain for runners, then share with you a few treatment and prevention guidelines. Hopefully, by the end of this post, you’ll have a better understanding of how to proceed in the presence of pain in the hip joint and surrounding tissues whether during or after your workouts. Since the hip joint plays a vital role in power, balance, flexibility, and momentum when running, it’s a common source of pain for runners. But here is the kicker. 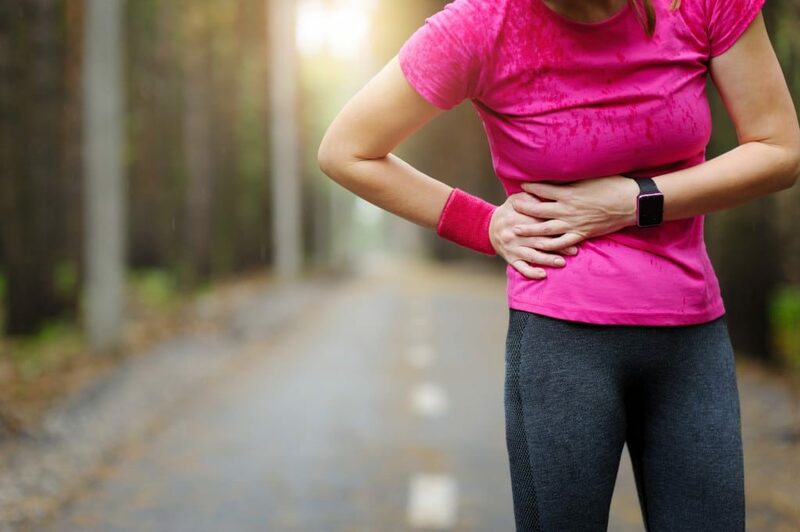 Diagnosing hip pain when running can be a fickle beast because more than one condition can be present at a given time, and some of these share similar symptoms. Also, the hip is a very complex joint that’s attached to many muscle groups. Hip pain can be blamed on a host of reasons. Much of the main causes will depend on when, where, and how they hurt and got injured. For instance, injury to the upper quads or hamstrings can manifest as pain in the hip region. For these reasons (then some), the exact cause(s) of a given case will depend on when, where, and how you experience/feel the pain. Pain can be caused by structures within the hip joint itself or from structures enclosing the hip joint. Pain might be experienced in front of the of the hip (usually as groin pain), the back of the hip in the buttocks, or on the outside of the joint. To help you clear away confusion, here are some of the most common causes of hip pain from running. Note—Keep in mind that not all of the below conditions are running/training-induced. Lifestyle decisions and genetics can also contribute to the onset of hip pain. Experiencing pain on the outside of the hip? Then you might have inflammation of the bursae. Also known as trochanteric bursitis, the condition is an inflammation of the bursae, which consist of small sacs of fluid between the tendon and bone that lubricate your joint, known as the bursae. This is located between the greater trochanter (bony prominence on the femur) and the muscles and tendons surrounding it. The bursae function as a gliding surface to limit friction between moving tissues of the body, lubricating the area between muscles, tendons, and bones. While running, the trochanteric bursa takes a lot of impact, and over time, it can get inflamed. Runners who suffer from bursitis report feeling a dull ache or burn, popping sensation on the outside of the hip during or after a run. Further, issues like direct trauma, pelvis issues, prolonged sitting, etc. can make the condition worse. Noninfectious cases of bursitis can be treated with enough rest, ice therapy, and anti-inflammatory medications. Reduce your mileage by 30 to 50 percent, steer clear of the hills, stretch your IT band and hamstrings after a run, etc. That said, infectious bursitis—very rare—call for medical intention. Antibiotics, and even, surgery, is required. 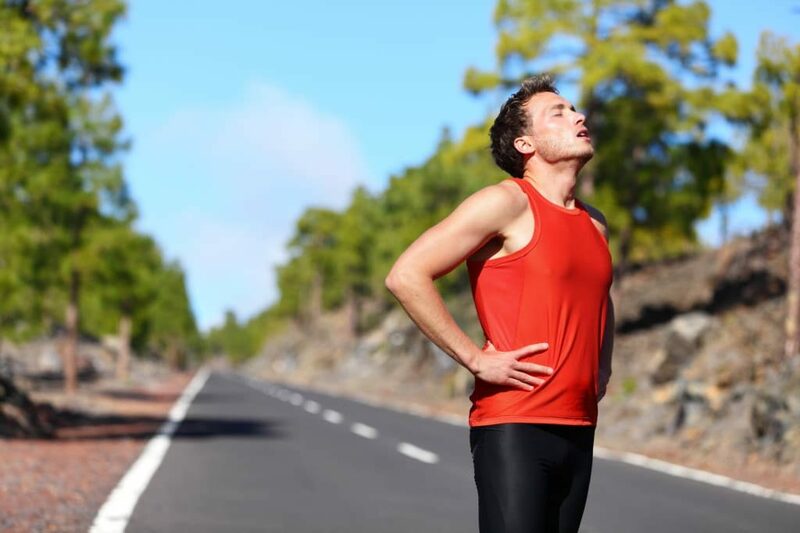 How much time you take off the running road depends on the severity of symptoms. If you feel pain when putting pressure on the injured limb, then cross train. Opt for activities, such as swimming, aqua jogging, cycling, rowing machines, etc. Another common cause of hip pain while running is muscle imbalances. These develop when you have relatively weaker muscles in one area of your body while the opposing muscles are stronger. This means that any strength/mobility imbalance in the hip flexors, glutes, or core muscles may lead to hip alignment issues, tears, or strains that cause pain. Hip-related muscular imbalances can be with a proper cross-training exercise program. The best way to prevent muscle imbalances, in general, is by following a well-rounded strength program that’s based on full body compound movements. These include pushups, squats, lunges, deadlifts, turkey getups, bridges, etc. But, all in all, single leg and balance exercises, such as pistol squats, are especially helpful in dealing with muscular imbalances in runners. Or visit a certified physician, who, after assessing your unique conditions, can prescribe a set of exercises and drills to fix your issue. Proper running form is also really important. Bad running form may force your hips out of alignment, resulting in wear and tear on the joint surface. This almost always leads to pain. It’s simple: fix your running form. Run tall with a slight forward lean. Keep your body relaxed from head to toe. Keep your core tight and back flat the entire time. Avoid overstriding by improving your running cadence and taking (relatively) shorter steps. Keep your head level, shoulder loose, and arms bent at a 90-degree angle. 3 Common Running form mistakes. If you feel throbbing or stabbing pain on the inside of your hip (or in the groin area), then you might have a stress fracture. If you experience pain coming more from the inside of your hip—especially if you end to run on hard surfaces like sidewalk or pavement—then you might have a stress fracture. Stress fractures consist of a break in the bone caused by repetitive strain. A fracture can be partial or a complete break, depending on the severity of the condition. Hip stress fractures are usually associated with the elderly, but they can happen at any age—especially among endurance athletes who do lots of impactful training. 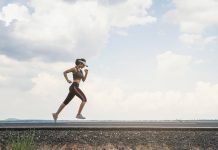 More specifically, in runners, the excessive impact can cause a small crack to develop in the femoral neck—near the ball at the top of the femur. These fractures can occur in the neck of femur—what’s known as the femoral neck. Stress usually manifest as a dull ache either in front or behind the hip, especially when exercising. Left unchecked, the pain will gradually increase until it becomes excruciating. If a stress fracture is what you’re dealing with, then running will make it worse. Stop running altogether and talk to a doctor to get the treatment you need. Treating this notorious injury may take six to eight weeks of rest—read: no running—but you might be able to do some low-impact cross-training. During the recovery period, feel free to cross train, opting for exercises such as biking or swimming, but only if your physician clears it first. Once your doctor gives you green light, ease into running, making sure to train on softer surfaces. The hip flexors are a group of muscles located in the front portion of the hip that work to lift the thigh upward and assist in a forward motion when walking or running. If you’re experiencing pain at the front of the hip, especially where your thigh meets your hip near the leg crease, then you might have a hip flexor strain. A hip flexor strain is the overstretching or tearing of these muscles. Since the gluteus medius—one of the three main glute muscles—and the hip joint are located in the same area, inflammation or injury to this muscle may affect the whole hip region and vice versa. Made up of three distinct muscles that run down the back of your thighs, hamstring injuries happen when muscle fibers are forced to bear a drastic load while fully or almost fully extended. Inflammation or injury of the top of the hamstrings can result in pain and tenderness in the top of the back of the thigh and the lower buttocks. If you experience pain or tenderness in the front of the thighs, then this may indicate inflammation or injury to the quadriceps muscles. When you overwork your quads, they can become strained from overuse, especially if they’re relatively weak and/or when doing too much downhill running. Treating muscle injuries is not complicated. Mild cases can be treated with the RICE protocol. As a rule, avoid any activities that put weight on the injured hip for the first few days after onset. Also, stretch and strengthen your critical running muscles, such as the glutes, hamstrings, quads, and calves, on a regular basis. For more on that check my post here. If you’re suffering from intermittent pain in the hip region, accompanied by a clicking or locking sensation, especially following a recent hip fall or twist, then you might blame it on a cartilage tear. Also known as a labral tear, the condition is a tear of the acetabulum, which is a thick ring of cartilage that cushions the hip joint. Cartilage tears can be a gradual onset caused by overuse and repetitive strain on the hip. These tears typically take place where the ball and socket joint insert. Typically, this injury is caused by trauma, as in a sudden fall or twist. They can also be acute, caused by a traumatic event such as a bad fall, collisions, etc. Again, stop running for a few days. Depending on the severity of the tear, your choice of treatment largely depends on the condition. In case symptoms didn’t improve, then see a doctor immediately. Some may recover with simple treatments in a few weeks, whereas serious cases require arthroscopic surgery to repair or remove the torn labrum and clear out a fragment from the joint. If you experience sharp pain on the outside of your knee and/or hip region, you could have iliotibial band syndrome (ITBS). This is especially the case if you tend to run on paved roads or track all season. ITBS is an inflammation or irritation of the iliotibial band, which is a tough tendon that runs down the outside of the thigh from the hip to the knee, connecting the hip to the shin bone. Tightness in the band, as well as weak hip and glute muscles, can lead to the onset of the condition. Your first line of defense is to reduce running by 30 to 50 percent or stop altogether if pain interferes with your gait. Also, strengthen your glutes and hip muscles and correct any muscle imbalances in the area. For the full guide on how to deal with ITBS, check my post here. Also known as osteonecrosis, this condition occurs when blood supply to the femoral head—the ball of the hip—is limited, resulting in the death of bone tissue. When Ignored the condition can result in tiny breaks in the bone, leading to the bone’s eventual collapse. If you just got diagnosed by your doctor, then it’s crucial that they refer you for an immediate MRI scan to confirm that you have avascular necrosis. As soon as you the result, start treatment, which may stop the condition from getting worse (and thwart the onset of arthritis). Check this post for an in-depth overview of how to slow and stop the progression of avascular necrosis. 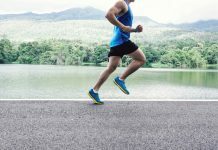 This is one of the lesser-known causes of hip pain in runners…something that not a lot of runners are aware of nor are willing to acknowledge—especially us city dweller. Here’s the truth. If you put safety first by running against traffic on the road, then you’re likely running on a cambered surface—without even realizing it. Sure, camber is useful. Having the center of the road a bit higher than the sides allows water to drain off, and helps motored vehicles gain better traction. However, running on inclined structures forces one of your legs to reach down a bit farther than the other, resulting in misalignments in the kinetic chain. Thus, increasing the risks of injury. Run on flat surfaces. When it’s possible, run in the middle of the road or try switching to the other side of the road. Or, stick to the sidewalk. Furthermore, listen to your body, especially following a run on a sharply inclined road. Also, consider adding some hip and lower back strengthening and stretching exercises into your cross-training routine. If resting and mild stretching didn’t help relieve your hip pain, or the pain got worse, see a doctor for a thorough assessment. Stubborn hip pain calls for a visit to a doctor or a sports medicine specialist for a thorough assessment. I hope the above advice will prove useful in helping you deal with and prevent hip pain when running. Please stay safe, and run strong.